Your carpet is a major focal point of your décor and is part of the first impression someone has when they enter your business. Those tell-tale dark marks left on high traffic areas such as hallways can really take away the appeal of even the most well-maintained offices. An annual professional carpet steam cleaning provides a deep cleaning that will help remove everything from odours to dust mites even from carpets that appear clean on the surface! Many people think a quick vacuum or home steam cleaning will do the same job as a professional steam cleaning. However, products designed for home use do not reach the extremely high temperatures used by professionals. Professional steam cleaners use water as hot as 200 degrees, which creates a steam vapour that not only extracts the dirt from your carpet but also the grease and oil build-up. It is important to remove all the oil and grease from your carpet as they act as a magnet for dirt, hair, and even dust mites. The high temperatures work together with safe, professional grade detergents to effectively dissolve the adhesive bond formed by greasy build-up. This allows the steam cleaner to completely remove all the dirt and build-up with far more effective results than a home steam cleaner. As well by removing the greasy build-up, your carpet will remain cleaner for longer. Home steam cleaners also tend to leave residue from your detergent, while professional steam cleaners powerfully rinse and remove all residue as they work. There are two reasons you want to ensure all detergent is removed. The first is that this residue acts in the same way greasy build-ups do, by attracting and holding onto dirt. The second is that detergents can leave behind chemicals that are harmful to your family and pets. We also offer an eco-friendly detergent option that will be as effective as our professional grade detergent. Finally, although using a home steam cleaner does help you remove some dirt, soiled areas that are greasy, as well as the new residue left behind from your detergent, will cause your carpet to become dirty again faster. Even newer carpets can have hidden dangers that affect the purity of the air in your office. This can include allergens such as dust mites, and bacteria. These particles remain in the air and are loosened when people walk about the home. You are breathing in these particles every day. Allergens cause symptoms that can include itchy, watery eyes, skin rashes, and even respiratory issues. More than 10 percent of people have a dust mite allergy and as many as 2,000 dust mites can live on a single ounce of carpet. This can cause serious breathing issues for those with allergies. In fact, even the dust in your carpet can cause respiratory challenges. If you have had any spills, leaks or flooding you can also have unseen mould or mildew beneath the carpet. It takes a professional steam cleaning to get hot enough and provide enough power to force detergents deep down to remove existing mould as well as to stop further growth. If not addressed, mould can actually penetrate floorboards, leading to structural issues. 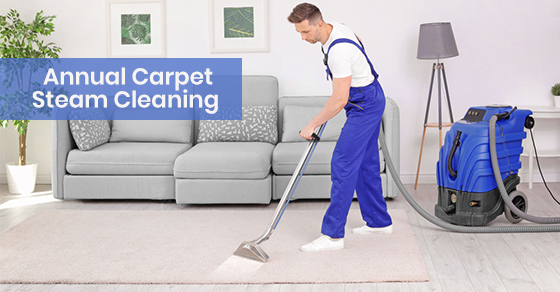 Most carpet manufacturers will recommend an annual steam clean to help protect your carpet from staining, as well as to remove odours and dirt build-up. This is even more important for those with children and pets. Dirt will be more obvious in high traffic areas which often require a more frequent cleaning, especially for lighter coloured carpets. Keep in mind that although a darker carpet might not show dirt, it doesn’t mean the dirt is not there! Regular steam cleaning will make your carpets easier to vacuum and keep clean. As mentioned, this is because you must remove that pesky grease that holds onto dirt. With less grime to cling to, vacuuming becomes a breeze. This, in turn, can help avoid wear and tear that prematurely ages your carpet. Nothing makes an office look more uncared for than a dirty carpet. Removing the dark markings left behind by dirty shoes provides a smooth, consistent look throughout your business giving it an instant update! As you can see there are many benefits to having your carpets cleaned annually. Your office will look better, your environment will be cleaner, and you will avoid potential illness for your employees. For more information about professional carpet steam cleaning services please call Sunrise-Cleaning at 905-567-1199 or contact us here.